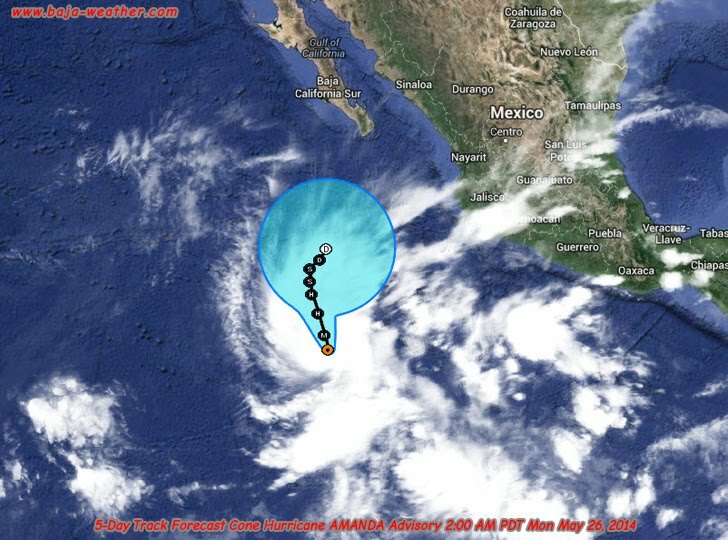 Hurricane Amanda has rapidly gained force far off of Mexico's Pacific coast and was Sunday the strongest May hurricane on record for the Eastern Pacific, with sustained winds of up to 155 mph (250 kph). Amanda has not changed much during the last several hours. The eye of the hurricane, although slightly ragged in appearance at times, remains evident with a ring of cold cloud tops surrounding the center. Amanda remains a powerful Category 4 storm of Mexico's Pacific coast. However, according to the last forecast at 02:00hr PST is hurricane expected to weaken at a rapid pace beginning later today. This is due to the combined influences of southerly to southwesterly shear, dry air intrusion, and decreasing sea surface temperatures. The hurricane's maximum sustained winds early Monday are near 140 mph (220 km/h). The U.S. National Hurricane Center says rapid weakening is expected to continue over the next two days. The hurricane was centered about 685 miles (1,105 kilometers) south of the southern tip of Mexico's Baja California peninsula and is moving north-northwest near 7 mph (11 km/h) at the time of that forecast. While Amanda was forecast to stay out to sea, Mexico's National Meteorological Service said rains associated with the storm were likely to drench much of western and central Mexico. Beyond a couple of days, the weakening tropical cyclone is expected to drift northeastward or become stationary when it is forecast to be more influenced by the low-level steering flow.